SPECIAL NOTE The banner size dimension increase by minium 10mm each side. USA The size dimension increase by minimum 1/2 inch each side. Exact Finish Size is not possible due to +/- tolerances of manufacturing beading edge products. Allow 1/2-2" ( 10-50mm) size variation above or below finished order size dimensions. 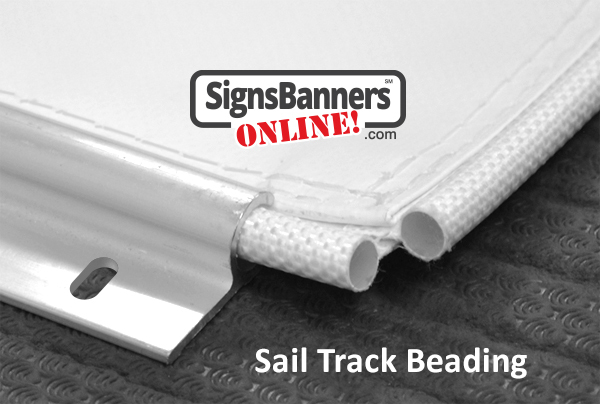 Sail track beading is typically by sliding the banner sign along the track into position. If offers a quick and repeatable method of installing banners and billboards. Wall banners, factory signs, highway billboards, repeatable and changeable graphics, pre-assembled signage. Sail Track Beading edge FINISH SIZES ARE NOT GUARANTEED nor promised. Use for changeable signs and pre-positioned graphics. SAFETY: Molten polymer causes thermal burns. For molten polymer, cool rapidly with water. Do not attempt to remove from skin. Obtain medical attention for burn. CONDITIONS TO AVOID Direct exposure to flame or excessive heat. Other sizes and Billboard size options. See factory support team pre order.